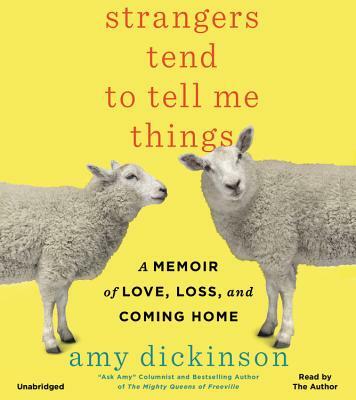 In Strangers Tend to Tell Me Things--her follow-up memoir to the NYT bestselling The Mighty Queens of Freeville--America's most popular advice columnist, "Ask Amy," shares her journey of family, second chances, and finding love. By peeling back the curtain of her syndicated advice column, Amy Dickinson reveals much of the inspiration and motivation that has fueled her calling. Through a series of linked essays, this moving narrative picks up where her earlier memoir left off. Exploring central themes of romance, death, parenting, self-care, and spiritual awakening, this touching and heartfelt homage speaks to all who have faced challenges in the wake of life's twists and turns. From finding love in middle-age to her storied experience with stepparenting to overcoming disordered eating to her final moments spent with her late mother, Dickinson's trademark humorous tone delivers punch and wit that will empower, entertain, and heal. Amy Dickinson writes the syndicated "Ask Amy" advice column, which replaced the Ann Landers column in 2003. "Ask Amy" appears in more than 150 newspapers in North America, including the LA Times, The Chicago Tribune, Newsday, The Boston Globe, the Denver Post, the St. Louis Post Dispatch and the Washington Post. She currently lives in Freeville, NY. "Amy Dickinson has written a simply wonderful memoir.